It might look dangerous, but for Sherry Clegg, J.D., hula hooping with the added element of fire is downright relaxing. Clegg, a Law Success Instructor at the School of Law, said fire hooping helped keep her sane during her own law school experience. Clegg first witnessed a flaming hula hoop performance at a festival when she was 18. She started hooping more seriously herself after graduating from college and taking a class at a dance studio. 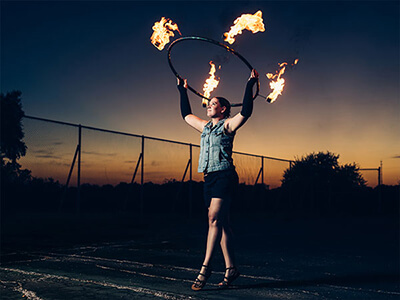 The first time she added a combustible element was during law school in Lubbock, where she found a community of hoopers and other flow artists, which includes jugglers.